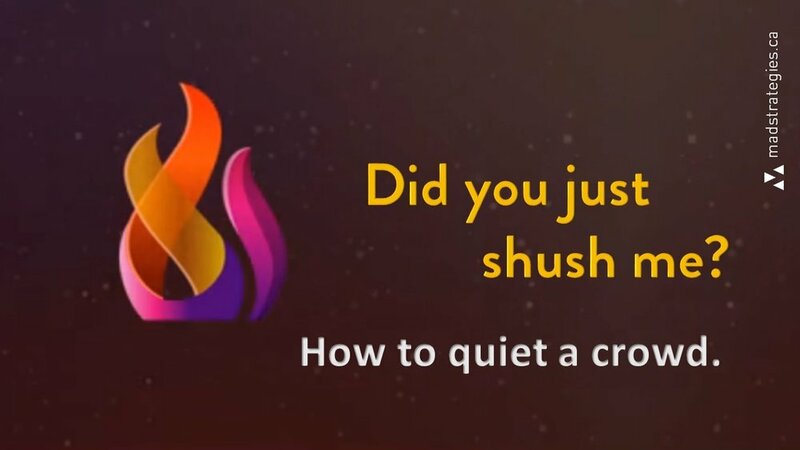 Did you just shush me? — MAD STRATEGIES Inc.
Did you just shush me? There are many times throughout an event where silence from the audience is required. Important instructions are about to be given, a presentation or movie montage is about to start, a speech is about to begin – or worse, is in progress. Despite the expectation that people will automatically be respectful and quiet when it seems so apparent that they should be, it happens that they continue to be a distraction that must be muffled for the enjoyment of everyone involved. Regardless, the stark reality is, justified or otherwise, no one likes to be shushed. But what if there was a gentler, better way to deliver the (albeit) difficult message of “please, shut up”? There is – it’s being tactful in the communication delivery. We created the above 2 screen video to delicately do just that. We played it at a recent Chai Lifeline Canada event. There was a countdown to provide the warning and then comedy to deliver the message: It’s almost time for the presentation to commence. Please find your seats, turn off your phones and be quiet. Grown ups want to be treated like grown ups. Ensuring that people are quiet when they should be, or getting them to line up in a specific format is just a matter of instruction. But the delivery of the command is just as important as receiving their cooperation. As with most directives, conveying a request creatively, politely, and with elegance garners greater enthusiasm and compliance. After all, events are supposed to be enjoyable for everyone, even those that need a little refresher on manners.